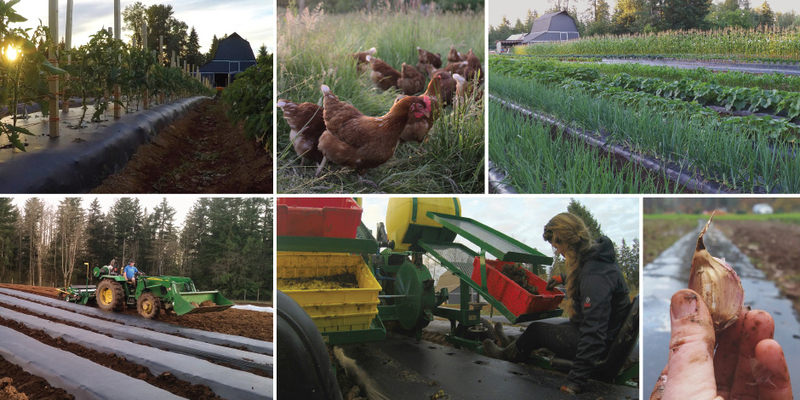 The idea of market farming became a possibility for us after visiting the Comox Valley and falling in love with the land, the climate, the rural farming communities, and the passionate drive for local sustainable food. Being raised on a homestead in the foothills of Alberta fostered my love for growing, inextricably connecting me to the land, so I knew it would only be a matter of time before I returned to my roots to provide this same upbringing for my young sons Rory and Callum. Attending Olds College environmental stewardship program and working for the municipal government in invasive species management before starting our family provided a solid foundation. My husband Jon is a heavy-duty mechanic and a natural problem solver who makes light work of many of the challenges we face with equipment, irrigation, and harvest. He is perfectly suited for life on a farm. As we move into our third growing season we find ourselves dusting off field notes from last year, ordering seed, crop scheduling, planning for another Community Supported Agriculture (CSA) season, and eagerly waiting to get our hands back in the soil. The learning curve these past few years has been steep, running mostly on trial and error, intuition, figuring out what works for our life and on our land, and raising two young boys. Our main focus is to improve our existing systems and scale the operation to a manageable size. We have struggled in the past seasons with workloads, scheduling harvests, and enjoying our lives along the way. A marker of success for us is avoiding personal burnout. So far, the rewards outweigh the challenges. We are committed to growing for our community, which has embraced us from the beginning. Last season we introduced our CSA pilot program with great success and along with our farmstand, regulars have created a tight knit family of customers. We’ve received a tremendous amount of feedback from people who love to see where their food is coming from and who want to know it is grown with care and intention. It is becoming more clear the direction our farm needs to go in order to achieve our goals as a sustainable market farm. In 2017, the addition of CSA members, post-harvest infrastructure, a propagation greenhouse, and improvements on growing techniques will bring us closer to making sustainability a reality. Our 20-acre farm produces all of the eggs and produce we sell at our weekday on-farm market and 16 week CSA program. You can find us right on the highway in Black Creek, at kehlervegetables.ca, or on Facebook.